2 Score the duck skin in a criss-cross pattern. Put the sugar, peppercorns, star anise and sea salt into a spice grinder or pestle & mortar and grind them together. Rub the spice mixture into the duck skin. 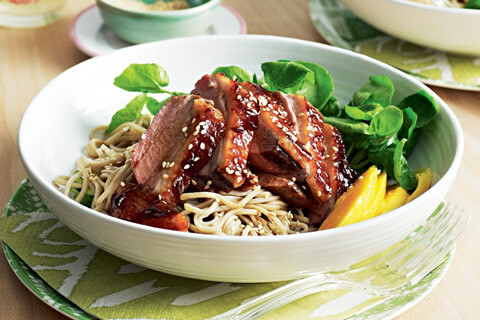 3 Put the sherry and soy sauce in a small non-metallic container, add the duck breasts, skin up, cover and marinate for at least 1 hour, or overnight, in the fridge. 4 Soak the dried mushrooms in 500ml boiling water for 30 minutes then strain the liquid into a roasting tin and finely slice the mushrooms. Put the mushroom slices in the roasting tin with the leek and butternut, season, cover with foil and bake for 30 minutes or until the butternut is soft. 5 Increase the oven temperature to 200C. 6 Heat a frying pan over high heat and sear the duck, skin side down, until lightly browned. Put the duck breasts onto a baking tray – ideally on a rack – this time skin up. Drizzle with the brandy marinade and roast for 10 minutes in the oven. 7 Arrange the butternut, leek and mushroom on four warmed plates and top with thinly sliced duck breast.